About ten years ago, I began to identify strongly with the term activism. Outraged by the inequality in the world I began activist actions in the ambitious (perhaps naïve) aim that we could challenge and change the structures that keep people poor. For me activism is about passion, creativity and perhaps a little dissidence. Over the years my activist actions have taken many forms, from wrapping my school in a 200m banner to marching across Britain. I’ve always been inspired by the act of people coming together for a common cause and have been lucky to experience the freedom to speak out about the injustices in our world. 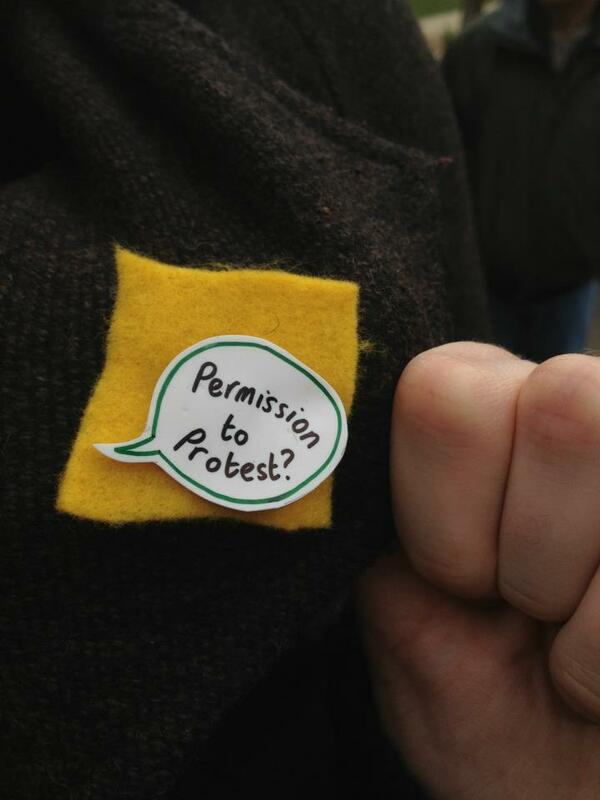 My latest craftivist action was provoked when the University of Sussex management served an injunction that requests everyone (including staff and students) must obtain written consent from the University before conducting any “protest action”. The injunction was served following a national demo against the privatisation of University services that brought over a thousand people together. Like many of the protest actions the OccupySussex campaign group have organised, I with many of the doctoral researchers within my School of Media, Film and Music attended the demonstration and experienced an uplifting atmosphere. At the start of the rally, we heard about a pop up union for the workers whose jobs will be privatised, an EDM going through parliament and about how our situation relates to a widercontext. We marched together. We chanted together. We stood together. 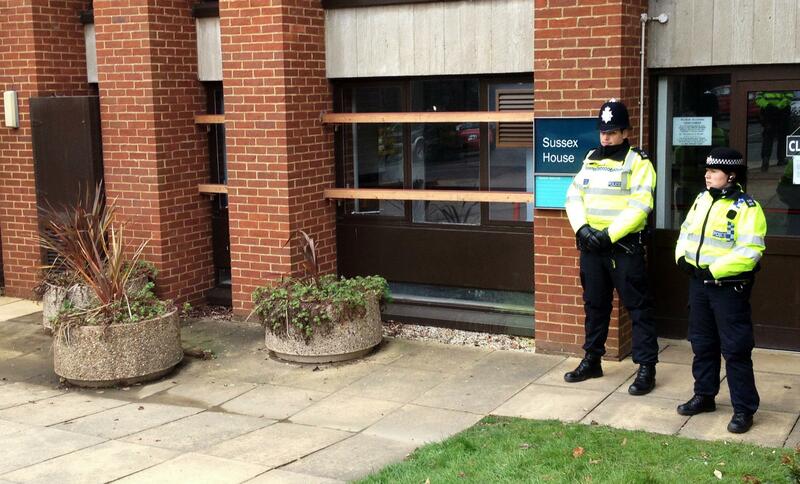 When we arrived at our University Management Building (Sussex House), we discovered bars with padlocks across the windows and that the staff had been told to leave so that protesters would not confront them. Like many of the Occupy Sussex protest actions that have so far included a 7week occupation, demonstrations, art exhibitions, music nights and guest speakers that have included MP Caroline Lucas, Owen Jones, Mark Steel and forthcoming Skype with Noam Chomsky, the majority of actions have remained peaceful. I was saddened and ashamed by the management’s decision to enforce an injunction that now makes it compulsory to have written permission for all “protest actions”. It feels counterproductive to have to ask the people we are protesting against for permission to protest. So on Wednesday 27th March 2013, I decided to return to Sussex House and tie a mini protest banner to the metal bars they have fixed to their windows. As they had more than 10 security guards watching the building, I decided to ask permission to tie my mini protest banner to the bars. The security guard agreed that it would be fine for me to do so. 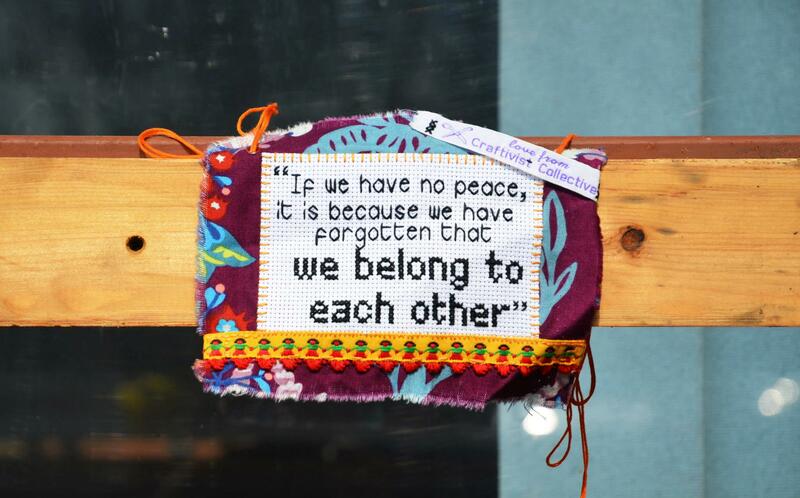 The mini protest banner included the following quote from Mother Teresa, “If we have no peace, it is because we have forgotten that we belong to each other”. After reading the injunction, I felt this quote was fitting as management clearly defined the University of Sussex their property not ours. Less than an hour later, I returned to Sussex House with more than a hundred protesters chanting, “the injunction will not function”. Sadly my mini protest banner had been removed. As the University Registrar John Duffy states that they are not banning peaceful protest actions, I can only assume that they felt a mini protest banner with a Mother Theresa quote on is in some way violent?